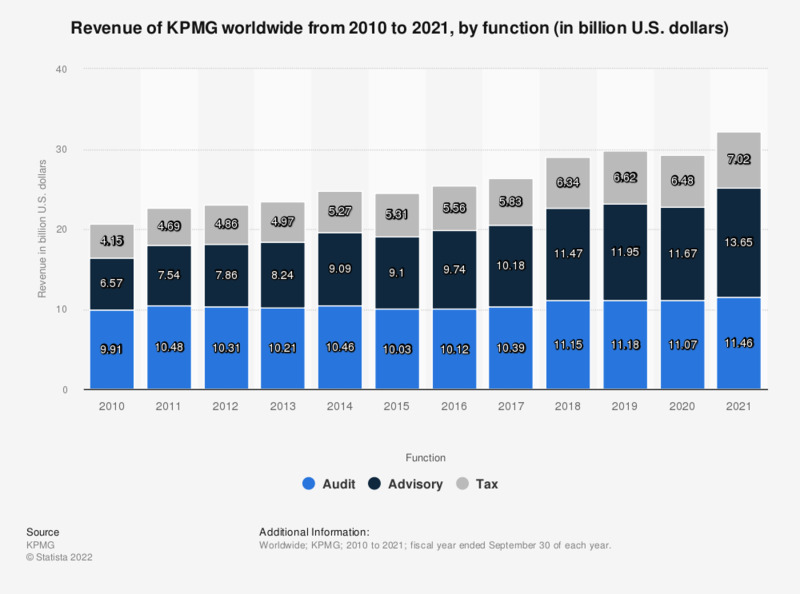 The statistic shows the revenue of KPMG worldwide from 2010 to 2018, by function. In the fiscal year of 2018, professional services company KPMG generated approximately 11.5 billion U.S. dollars from its advisory services. Fiscal year ended September 30 of each year. KPMG refers to KPMG International (KPMG International Cooperative), a Swiss entity that serves as a coordinating entity for a network of independent member firms operating under the KPMG name, and/or to any one or more of such firms. KPMG International neither provides client services nor generates any revenue. Values up to 2017 were taken from previous editions.